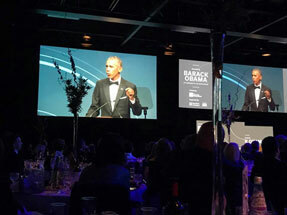 THE Watson Foundation was privileged to be present when President Barack Obama addressed a 1000-strong crowd at Edinburgh’s International Conference Centre. 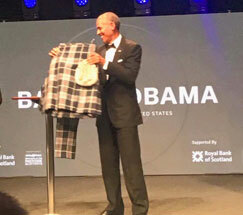 The 44th President of the United States was in Scotland as a guest of The Hunter Foundation run by Sir Tom Hunter. 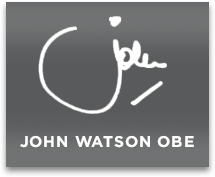 The Watson Foundation shares The Hunter’s Foundation’s ideals on philanthropy and helping others. 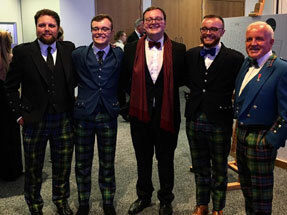 John M Watson OBE who attended the event with guests of the Foundation and his four sons Angus, Sandy, Fergus and Finlay said: “President Obama was completely inspiring and delivered a speech which enthralled and delighted the audience. “He is undoubtedly a world-class statesman whose eight-year tenure as President was characterised by success and achievement.